The Reagan Legacy Project is an effort initiated in 1997 by Americans for Tax Reform to memorialize the spirit and achievements of President Ronald Wilson Reagan by naming at least one significant landmark in each state and every county to preserve the legacy of the 40th U.S. president. “Whether it be the Ronald Reagan Parkway in Indianapolis, IN or Ronald Reagan National Airport in Arlington, VA; each and every dedication will serve as a teaching moment for generations to come,” writes Grover Norquist, President of Americans for Tax Reform. There are over 3,000 significant landmarks, including highways, buildings, and schools named after President Reagan, but none in Nevada. In 2010, Citizen Outreach launched an effort to remedy that situation, focusing on naming a mountain or mountain peak after the president. Establishing an official “Mount Reagan” would be a significant and well-deserved commemoration of the American president who is credited with ending the Cold War in the 1980s. The MOUNT REAGAN PROJECT is being pursued in cooperation with ATR’s Reagan Legacy Project. The late state Sen. Bill Raggio suggested changing the name of Boundary Peak – the highest summit in Nevada’s White Mountains near the California border – to Mount Reagan. However, Boundary Peak is located within the Boundary Peak Wilderness Area, and the federal Board on Geographic Names (BGN) highly discourages naming or re-naming any features within federal wilderness areas. It’s also located in a very remote area; what Las Vegas Sun reporter Ken Miller referred to in a 2010 story on the effort to rename Boundary Peak, “The middle of nowhere.” Indeed, Boundary Peak is a good four-hour drive from Las Vegas – making it extremely difficult and inconvenient for the average person to visit from the state’s primary tourism hub. Similar challenges were encountered in efforts to identify a suitable peak in the Spring Mountains – a short distance northwest of Las Vegas and easily accessible by car – especially in the areas of Mt. Charleston and Lee Canyon. The most significant, readily identifiable peaks in that area are already named. However, on the east side of Las Vegas there is a very prominent mountain formation that most locals incorrectly call “Sunrise Mountain” – so nicknamed because, depending upon where you live or work, the sun comes up directly over it every morning. The correct name of that mountain formation is Frenchman Mountain, and it’s part of a much larger tract of land known as the Frenchman Range. The real Sunrise Mountain is actually located further to the north and east of Frenchman Mountain and is not readily visible to most of the Las Vegas valley. Upon further investigation; however, it was learned that none of the three highest peaks – accessible to hikers – on Frenchman Mountain are presently named. So with BGN guidelines and principles in mind, it would appear that a proposal to name one of those un-named peaks “Mount Reagan” would be more likely to receive favorable consideration than renaming the entire mountain. “Mount Reagan” would simply be the name of a peak at the top of Frenchman Mountain – just as Mount Washington and Mount Jefferson are peaks located on the White Mountains of New Hampshire. While Ronald Reagan clearly meets the BGN standard of having “an outstanding national or international reputation,” the president did, indeed, also have significant ties with and made significant contributions to the state of Nevada. For example, one of Reagan’s earliest ties to the community came in 1943 when he and fellow actor Burgess Meredith spent time at Nellis Air Force Base – a short distance away and visible from the top of “Mount Reagan” – filming the World War II promotional film Rear Gunner. 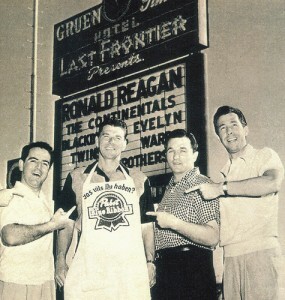 In 1954, Reagan returned to Las Vegas and earned the distinction of being the only United States president to perform in a nightclub act on the world-famous Strip. Murphy James, author of When the Gipper Played Vegas, writes that “1954 was the turning point in Reagan’s career,” which at the time was in a slump. That included moving into politics. As governor of California in 1969, Reagan worked with then-Nevada Gov. Paul Laxalt to create the Tahoe Regional Planning Agency which is charged with protecting Lake Tahoe and the scenic area surrounding it. And as president, Reagan scrapped a controversial and potentially dangerous underground MX missile basing proposal that would have been located primarily in Nevada. During his presidency, Reagan maintained strong ties to Nevada through his relationship with Sen. Laxalt, who was known to be Reagan’s closest congressional confidante (often referred to as “The First Friend”). Indeed, Laxalt served as national chairman for all three of Reagan’s presidential campaigns and had his name floated as a possible vice presidential running mate in 1980. In addition, Reagan also had close ties to two other prominent Nevadans during his two terms in office. Nevadan Frank Fahrenkopf served as Chairman of the Republican National Committee from 1983 through 1989, the longest-serving RNC chair of the 20th century. And Sig Rogich, who served as Reagan’s National Advertising Director in the 1984 re-election campaign which perhaps is best-remembered for the “Morning in America” television commercials Rogich helped create. Reagan’s support in Nevada was also exceptionally strong among voters. He won the state overwhelmingly in the 1980 election with 62.54% of the vote, and actually exceeded that total in 1984 with 65.85%. The Nevada Board on Geographic Names approved the designation in the fall of 2010. However, Congresswoman Dina Titus introduced a bill to name the peak something else, thus short-circuiting the administrative process and throwing the issue to Congress. The effort to establish “Mount Reagan” at the top of Frenchman Mountain in Las Vegas has been introduced in the House of Representatives in 2011, 2013 and 2015 but has not yet received a vote. Efforts to re-introduce the “Mount Reagan” bill in 2017 are pending.